Finest STERLING SILVER, DOUBLE picture Frame 5" x 6.5". Made in ITALY. Our children's collection comes directly from ITALY where the highest quality meets class and style. 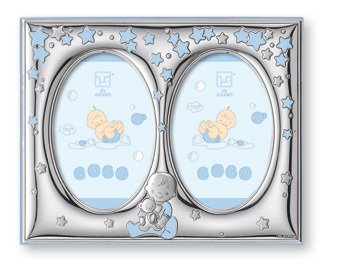 This gorgeous frame is hand made in .925 STERLING SILVER featuring a boy (blue) or a girl (pink). Slide tab enclosure back. The outside measures 5 x 6.5 inch, and each frame can hold a picture size 2.25 x 3.5 inch. Will never tarnish. No special cleaning required, use only a dry dust cloth. You are invited to check out all our children's collection of one-of-a kind items for your boy or girl. Special features make this design unique. Each of our sterling silver frames and gifts comes with its own certificate of authenticity. The most skilled craftsmen and finest designers from Italy created our sterling silver frames and giftware. A special attention is given to every detail, creating a spectacular work of art that will last for generation. All of our sterling silver pieces are tarnish-free.